Earn $5.52 in Rewards credit (552 points) What's This? Arm yourself from wrist to fingertip in serged seam neoprene protection with Assos’ RainGlove_EVO7 and become a formidable opponent to foul-weather. 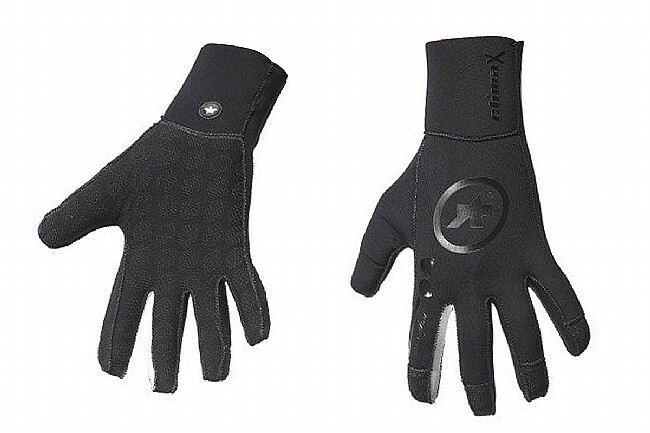 Made of lightweight and supple neoprene with anatomic paneling and contouring, this glove provides an exacting fit with a close-to-gloveless feel that facilitates natural shifting, braking, and bike handling. The insulating properties of neoprene combined with an extended cuff and reinforced seams ensure enduring warmth and rain protection. Since this glove was designed for riding in the rain, the palm features grippy silicone that’ll keep your hands firmly in place for uncompromised control. Ideal Climate: Wet and moderately cold. Material: (Outside) 92% Polyamide, 8% Elastane; (Inside) 100% Polyamide.